Leo Loudenslager's Laser 200 is the monoplane that toppled the Pitts Special and became the benchmark from which modern aerobatic planes evolved. The Pitts Special was literally untouchable in the U.S. as it dominated American unlimited aerobatics year after year in the early 1970's. The idea of an American built monoplane competing with a Pitts was ridiculous. At least it seemed ridiculous until Leo and his Laser 200 dethroned the Pitts by winning the United States Aerobatic Championship seven times. Leo convinced the world that his monoplane was a force to be reckoned with by winning the World Aerobatic Championship in 1980! 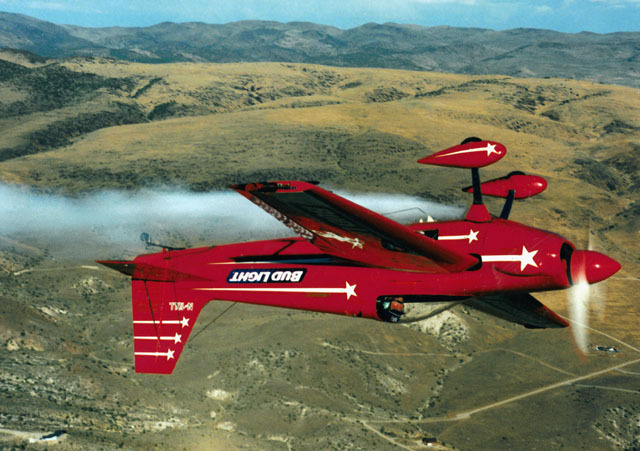 Leo and his Laser 200 made a huge impact on the world of aerobatics as many of the top aerobatic planes competing today are modeled after the legendary Laser 200. In the late 60's Margaret Ritchie and Mary Gaffaney were rivals for the women's National Championship. Margarette's Taylor Craft just wasn't cutting it anymore. So she hired an Aeronautical engineer by the name of Clayton Stephens to build her an airplane that could compete! Mr. Stephens went against conventional wisdom at the time and designed a mid-wing monoplane called the Akro. This was touted as the plane to beat the Pitts! Unfortunately Margaratte Ritchie's life ended tragically when she crashed her Akro. This all happened just about time that legendary Leo Loudenslager decided to pursue his dream of becoming an aerobatic pilot. This American Airlines pilot was looking for an unconventional airplane to compete against the dominant Pitts Special. So he ordered a set of Akro plans from Stephens. Leo was an absolute "airplane nut"! Never having competed before in his life, he built this Akro in his basement and entered the U.S. Unlimited Class in the 1971 finals. This guy came out of nowhere and he wasn't messing around! He was the first rookie ever to compete in the Unlimited class. Although he didn't win, his performance definitely got people's attention. The Laser 200 is Born! Leo spent the next four years making this plane his very own by modifying just about everything on the airplane. This included the wings, airfoils, instrument panel, turtle deck. He basically changed everything except the section of fuselage between the cockpit and tail. Only 10% of the original Stephen's Akro remained intact. This new version of the Akro was dubbed Leo's Laser. Leo gave it another shot at the National Championship in 1975 and took home the bacon. He proceded to dominate U.S. aerobatics taking first place in 1976, 1977, 1978, 1980, 1981, and 1982. His dream of winning the World Aerobatic Championship came true in 1980. There is only one other American in history to achieve this. Although the Pitts Special will always have a special place in our hearts as the first true aerobatic airplane, Leo and his Laser convinced the world that monoplanes were the future of aerobatics. The aerobatic world, including us RC fanatics, owe Leo a great deal of gratitude for the hard work, dedication, and passion that he put into redesigning this airplane. 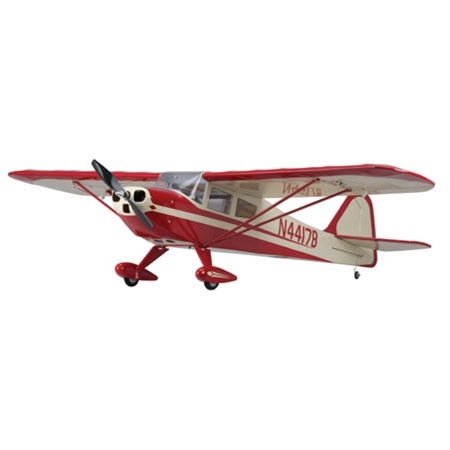 This fundamental design is the basis from which many modern aerobatic aircraft are modeled after. Leo's life ended in an ironic tragedy. After all those years of physically demanding and extremely dangerous aerobatics, Leo lost his life from a motorcycle accident in 1997. Leo is a true legend and will be missed by the aerobatic community. The Laser 200 is what inspired German pilot Walter Extra, founder of Extra Aircraft LLC to design and build his first airplane, the Extra 230. 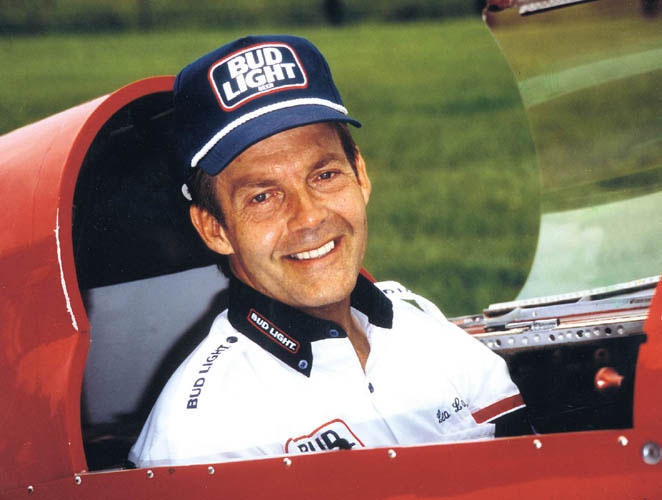 Bill Zivko, founder of Zivko Aeronautics entered the aerobatic arena when he mounted his fully composite Edge ZA-1 wing on the fuselage of a Laser to form the Edge 360. Unlimited aerobatics is a very competitive sport. Pilots are always looking for more power and lighter air frames. From the mid 1980's through the 1990's, designers began to developed very strong light-weight to composite materials to build the wings and fuselages. The Laser with its wooden construction and smaller engine can no longer compete with today's larger, lightweight, and much more powerful composite airplanes.